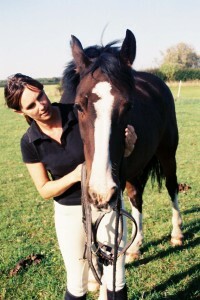 In April 2011 Ulla Balletta of Bedfordshire lost her horse William to grass sickness, a disease she had never heard of. The loss of William was so harrowing that Ulla decided more people should be aware of the disease, so that if it happened to them they would not be in such a vulnerable position. In addition to raising over £1300 for the Equine grass Sickness Fund, Ulla founded a Facebook group – Equine Grass Sickness Awareness. To date this group has over 1700 members, who find it a valuable source of support and information about the disease. More importantly it provides a ground swell of opinion that shows that people care about this disease and finding a cause. This page is dedicated to William’s memory, and as testament to our determination that the cause and a means of preventing this disease should be found. Thank you to Ulla for her work, and to William, a very special horse. William was put to sleep on 30th April 2011 after it was confirmed he had acute grass sickness. I will never forget that day it was heartbreaking. It all happened so quickly, one minute I had a happy healthy horse and 24 hours later he was gone without any warning. His symptons started on the 29th April, it was the day of Prince Williams wedding. When I arrived at the yard and brought him in from the paddock I realised he was not himself, he seemed depressed and was not eating or drinking which was not like him at all. When the vet arrived he diagnosed him with colic and said his only chance was surgery, I remember him saying what a tough horse William was as on the outside you could not tell by looking at him how ill he was, his heart rate had gone up to 80 (by the time we got to hospital his heart rate was 100). We were on our way to hospital thinking he was going to have an operation for colic which was bad enough, when we arrived he was checked over by the vet which was when grass sickness was first mentioned, I was warned that William was very ill and that he was very worried about him. I had never heard of grass sickness so when I arrived home that night I was on the internet straight away trying to find some answers, the more I read the more scared I was, it was not looking good. The next morning the vet phoned me at 9.30 to let me know they were going in to operate but that if it was grass sickness William would need to be put to sleep. I have never forgotten that morning waiting for the phone to ring but dreading what I was going to hear. I kept telling myself that the longer I waited the better it looked, hoping and praying that I would get a phone call telling me it was all ok and he was coming home. At one point I even thought that the fact he had the same name as Prince William was a good omen, but it was not meant to be, grass sickness was confirmed and he was put to sleep. I will never forget how helpless I felt, everything was taken out of my control, I had known nothing about grass sickness I did not even know there were 3 forms of it or that horses could survive the chronic form. For several weeks it haunted me that what if he had had chronic grass sickness and I was not even given the choice to try and nurse him through this, he was taken from me so quickly without any warning. All I could think the next day was why did I not stay with him, did I give him a big enough hug and hoped that he knew how much I loved him. I felt for along time and sometimes even now nearly a year on that I let him down.. I still picture his head over the stable door looking so sad and every time I was out of sight he would neigh as if to say where are you, please stay with me. I miss him terribly and the memories of that day are still very fresh in my mind, it was the shock of how quickly it all happened. This was a devastating experience made worse by not knowing the facts about grass sickness and this is what drove me to start my fundraising and to raise as much awareness as possible. It is so important for horse owners to know about grass sickness and also what you can do to try and minimize the risks. If it ever happens to your horse you need to be fully informed so that you know what questions to ask, still today from what I have read there are vets who are very quick to advice that they are put to sleep. It is important to know that if they are diagnosed with chronic grass sickness that they have a chance of survival, there are some wonderful stories of survivors who have gone on to lead normal lives. I just wish William had had that chance. He was a great character and very sadly missed. In my heart of hearts I knew why you were emailing me but in the brief time I waited for your response to my reply I allowed myself to hope that William might need a home and I’d be telling my husband we’d have to make arrangements. But I was crying even before your second email arrived. You’ll know this more than anyone but he was a truly special soul and I feel utterly privileged that he was part of my life for nearly five years. He was my first horse, the one I had been dreaming about and waiting for since I was six years old, and fate could not have sent me a better equine partner. When I made the tough decision to sell him and he was being vetted for the new owners, he was such a total gent and so cuddly and cheeky and at the end I said in front of the vet ‘Oh, William, will I ever find another horse like you?’ and the vet looked at us both and said bluntly ‘No, you won’t, he’s extraordinary.’ She was right. As you found, he never needed the vet in the time I had him either – except once when the farrier punctured his sole and sent him lame. He was like a super-horse! My husband keeps hugging me and reminding me what a wonderful life William had, and it is true. He started off in Ireland, hunting (! ), so not a great start but from then on he had it good, I think. A dealer brought him over to Sussex because he could jump like a stag. The dealer liked him so much he gave him his own name – William! When I went to see him, he was in a stable looking very curious and pleased to see a visitor. I tried him the school for no more than 30 minutes – he was super-sensitive and very speedy and strong, and I was very nervous. He was rising 7 years and only knew how to go in a straight line, very fast, and jump. My husband and I spent some time with him in the stable and field and the dealer tried to do a sales job on some other horses but I was taken with William and his white tummy. We agreed I could have him on trial for a week as the dealer knew the owner of the yard I’d keep him at. A few days later he was delivered to the yard at Roehampton Gate, Richmond Park (I lived in Chiswick at the time). He was unfazed by everything and seemed quite pleased to get lots of attention. After 24 hours one lady at the yard said – he is a horse who needs to know who is owner is. He needs his own human. Very true, he needed to bond with someone and we became great pals immediately. On our first ride out into Richmond Park we met a huge thunderstorm with thunder, lightening and pelting rain. While the yard owner’s horse backed itself off a bridge in fear, William carried on without a blink and I knew we’d be ok. A few weeks after that he lay sunbathing in a turnout pen and let me lie next to him with his head in my lap. I decided he was like a Labrador in a horse’s body. You wondered what I got up to with him. Well, not as much as some people thought I should. The general opinion in the early months was that he was wasted on me and should have gone to someone who would event him seriously, even if only at one day level (I had an ex-Eventer instructor, with hindsight, a mistake). He jumped four feet with ease, had fantastic natural paces and was brave and unstoppable cross-country, I literally just had to sit there and he looked after me. But I was not so brave, or so flush with finances to support that – we didn’t even have access to transport! So I enjoyed William for his character, as a much loved pet, and as a horse who would take me to local shows and round cross-country courses. My friends and family all had a ride on him, even a four year old rode him. We all enjoyed his ‘sense of humour’ and his affectionate nature. We were lucky to have Richmond Park as our first hacking territory but then he and I moved out to Windsor and so Windsor Great Park became our playground for a couple of years. They had monthly shows and regular pleasure rides with fences, but my best memories are of our three or four hour hacks out exploring the park (it was 14,500 acres, so you could spend a day there!). He was so happy there, totally spoilt by the yard owner. He also had a ‘girlfriend’ and used to jump two sets of post and rail fences in the paddocks to get to her! 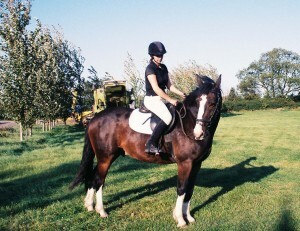 Then we moved to Warwickshire and found a fab instructor, plus I found a younger, braver girl who was looking for a ride. So William did some UK Chasers stuff (he qualified for the final but that was when the farrier punctured his sole) and some Discovery and Foxhunter classes (but only ever on a ticket). All the time I had William we had regular ‘playtime’ in the school. It started as loose schooling but then we just messed around together (no matter which yard I was at, no-one understood why I did it!). I did not realise it until after I sold him but we were really practising ‘joining up’ and something akin to natural horsemanship. I only discovered Parelli after I’d let William go but I can well imagine it was up his street. I am so sorry your journey into it was cut short, it sounds like you would have loved it. I honestly can’t believe how lucky I was to have William as my first horse. He was fresh and alert and clever while still being safe. He genuinely looked after me a couple of times, honestly saved me from injury through his actions. He had his loony moments as a youngster but there was never a hint of malice, it was always playful and kind. I hope I helped him too, he got no end of affection and pampering, and I am glad he did not get stuck as a hunter or pure competition horse somewhere without his ‘own human’.